When I first launched this Conscript Heroes website, I included a page about other evaders mentioned in my father's diaries or otherwise connected to the story. One of those evaders was Sgt Pilot William Guy Lockhart. Some time later that entry was picked up by James Crowden who offered to put me in touch with Tanya Lockhart, Guy's daughter. We soon found that we all lived quite close to one another, arranged to meet for lunch, and have kept in touch ever since. In April 2011, James called to say that someone else had become interested in Guy's story and another lunch date was agreed. By this time James had acquired all kinds of information about Guy, including details of his time with 161 SD Squadron flying Lysanders to France. 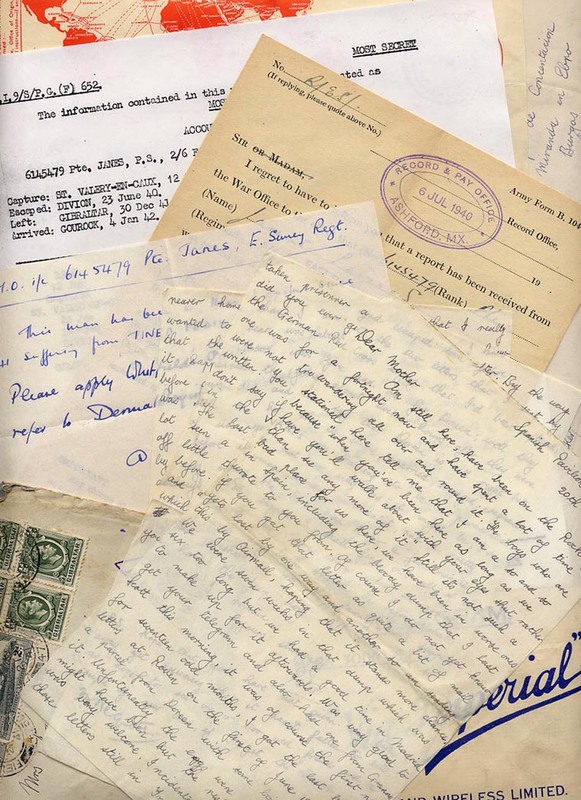 I already had the basic details of his missions - and had passed them on to Tanya - but James had acquired documents from the National Archives at Kew (thanks to Len Barnett) that included the Squadron Diary and Guy's original flight reports. I have used these documents as the basis for this article on the grounds that they are (or could be) typical of the experiences of a 161 SD Lysander pilot in 1942. Most of the passenger details (which are not included in the flight records) come from Hugh Verity's book 'We Landed by Moonlight' together with additional information from other sources – details on request. Guy Lockhart first joined the RAF in October 1935. He was granted a short service commission as Acting Pilot Officer and sent to No 2 Flying School at Digby the following month. In October 1936 he was posted to 65 Squadron and in March 1937, to 87 Squadron at Tangmere flying the Hawker Fury. In July 1937 the squadron was moved to Debden and re-equipped with Gloster Gladiators. In May 1938 Lockhart was involved in a low-flying incident at Stoke-on-Trent Municipal Airport at the Empire Air Day Flying Display that resulted in a court martial. He resigned his commission in August and became a flying instructor with the West Suffolk Aero Club. In 1939 Lockhart re-enlisted with the RAFVR as a Sergeant Pilot and after ITU, joined 7 (later 57) OTU flying Miles Master trainers and Spitfires. In June 1941 he was posted to 602 Squadron flying Spitfires. Later the same month he was transferred to 74 Squadron and on 7 July 1941, shot down over France in Spitfire W3317. He evaded capture and returned to the UK in October 1941. The following month he was posted to 138 Squadron as a Pilot Officer (on probation) and in February 1942, transferred to the new 161 Special Duties Squadron, flying the Westland Lysander. 1 March 1942 (SOE Operation Crème): This was F/O Lockhart's first operational Lysander flight to France. He took off from Tangmere at 20.25 hrs in Lysander V9428 and crossed the French coast near Cabourg at 9,500 feet. After some difficulty in finding his target, Lockhart landed in a field near Les Lagnys (Indre, NNE of Chateauroux) at 01.30 hrs. Less than two minutes later, and with his passengers Stanlislas Mangin and Louis Andlauer safely on board, he took off again. The return flight was made at low altitude because of heavy cloud, crossing the French coast east of Cherbourg at 1,200 feet and landing back at Tangmere at 04.07 hrs without incident. 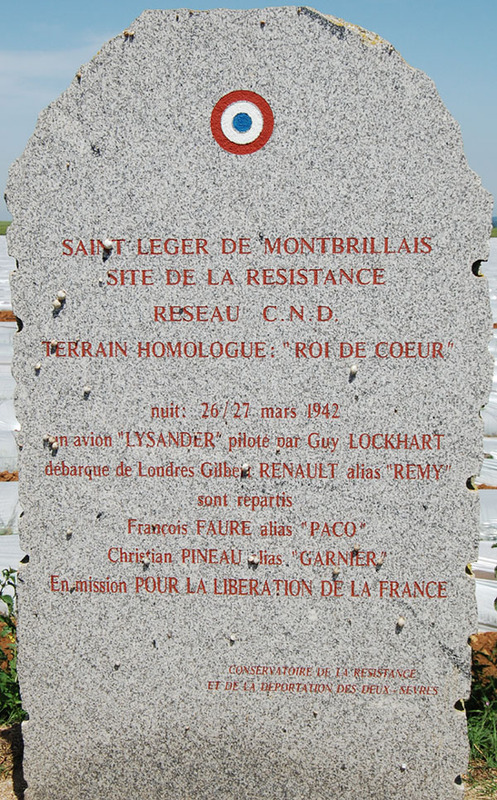 26 March 1942 (SOE Operation Baccarat II): F/O Lockhart took off from Tangmere in Lysander V9367 at 21.25 hrs on with BCRA agent Gilbert Renault-Roulier (Remy) on board. Heavy cloud cover prevented pinpointing his position as they crossed the French coast and Lockhart flew on instruments until he reached the river Loire at about 23.30 hrs. He then turned east to Saumer before turning south for his target. On receiving the correct signal from the ground and responding, he landed in the Roi de Coeur field north-west of St Leger de Montbrillais at 23.45 hrs. He landed close to the landing lights and applied full brakes but the aircraft still ran on and fell into two troughs of ploughed ground. On turning the aircraft, he sank up to the wheel spats and despite applying full power was unable to extricate himself. He sent Remy to get help and the reception party pulled the aircraft around until Lockhart was able to taxi to firmer ground. Two passengers (Christian Pineau and Francois Faure) climbed on board and Lockhart took off again after seventeen minutes on the ground. Visibility was still very restricted by clouds and it wasn't until shortly before the English coast that it cleared enough to make a safe landing at Tangmere, touching down at 01.45 hrs. The photograph (courtesy of Peter White) shows the memorial erected at the landing site commemorating this operation. 24 April 1942 (SIS/SOE Operations Apostle and Jellyfish): F/Lt Lockhart took off from Tangmere in Lysander V9597 at 23.30 hrs and set course for Cabourg but bad weather over the Channel and a failing magneto forced him to turn back. However on retesting the engine five minutes later he found only a marginal drop in performance and so he turned again for France. He crossed the French coast west of Le Havre at 00.30 hrs but worsening weather forced him to return to Tangmere, landing at 01.45 hrs. 26 April 1942 (SOE Operations Gazelle and Jellyfish): F/Lt Lockhart took off from Tangmere in Lysander V9597 at 22.35 hrs with Pierre Beech (Gazelle) as his passenger plus some baggage. The weather deteriorated over the Channel but improved as he pinpointed himself over Cabourg at 23.30 hrs. The weather continued to improve until the target area where there was ten-tenths cloud at 5,000 feet. Lockhart had some difficulty in locating his target but received the agreed signal at 01.45 hrs and landed at Faucon field (10 miles NNE of Chateauroux) three minutes later. I quote this account of events from Lockhart's report dated 29 April although it should be noted that a subsequent report dated 10 May is nowhere near as entertaining. The later version is presumably the result of a letter dated 4 May 1942 from the Air Ministry to W/Cdr Fielden complaining that S/Ldr Murphy's reports in particular 'rather savours of the mess fireside' but also commenting on Lockhart's original report on Gazelle/Jellyfish, and saying they weren't suitable for passing up the line to C.A.S (Chief Air Staff). "After some difficulty in finding the target, I received the agreed signal at 01.45 and touched down three minutes later. Unfortunately the landing ground was on a hill and as I descended Mother Earth came up to meet me, the result being a dull thud. The engine commenced to burn with considerable ill-feeling so I switched off and searched for a fire extinguisher, but could find only an incendiary bomb. Meanwhile Gazelle disembarked with luggage and faded into the gloom, leaving me to go up with the aircraft like a good Captain. After six or seven minutes I was about to burst into tears as a last resort but this was unnecessary as the flames died out unaided. I therefore started up and taxied back to light A where the two passengers embarked like men possessed. Airborne again at 02.00, I set course for Cabourg, pinpointing myself there at 03.15. Weather was bad over the Bay of the Seine but excellent over the Channel. I called up Medoc when five miles south of Littlehampton and landed at 04.00." The two passengers were Gaston Tavian (Collin) and Lt de Vaisseau Mariotti (Rousseau) and it was Tavian who had chosen the landing field and nearly caused a disaster – future landing sites were only to be selected and marked by agents trained in England. 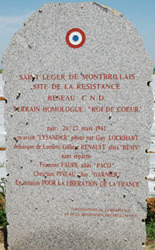 28 May 1942 (SOE Operation Gean): F/Lt Lockhart took off from Tangmere in Lysander V9597 at 23.25 hrs. He was carrying one passenger and 150lbs of baggage and intended to fly to landing field north of Chateauroux, 2 kms east of Les Vignots. Although the weather was fine across the Channel, it deteriorated as he approached his target area. Receiving no return signal from the landing field, nor the two alternate fields that he circled for an hour, he was forced to abandon the mission and return to Tangmere, landing at 05.20 hrs. On the nights of 23/24 June, 25/26 June and 26/27 June, F/Lt Lockhart flew one of four Lysanders tasked with bombing missions to Normandy, the first to the marshalling yards at Sequeux and the other two to a chemical works at Oissel. Each Lysander carried two 250lb bombs but I have no details of the success or otherwise of these operations. There was a period from June to August 1942 when the networks in France were in such turmoil that pick-up operations were suspended and so the Lysanders were sent on alternate missions to France - 161 Lysanders also carried out at least two more similar bombing raids at the end of July. 23 August 1942 (SIS Operation Mercury): S/Ldr Lockhart took off from Tangmere in Lysander V9597 at 21.45 hrs with one passenger (who Verity identifies as the Belgian agent William Ugeux). His target is given in latitude and longitude and corresponds to a present-day airstrip at Thalamy (east of Ussel, Limousin) where he landed at 01.05 hrs. Lockhart reports the field as being excellent except that it is on a slope and that the flare path had been laid down-wind and down the hill, requiring him to switch off his engine to avoid the aircraft from running away. He was on the ground for eight minutes, during which time his passenger got out to be replaced by another (identified as Leon Faye (Aigle) of Alliance) before taking off again at 01.13 hrs and landing back at Tangmere at 03.55 hrs. 31 August 1942 (SIS Operation Boreas II): S/Ldr Lockhart took of from Tangmere in Lysander V9597 at 21.50 hrs. His target is given in latitude and longitude and corresponds to a field near Arbigny (about 20 kms NNE of Macon) but whether this was his intended destination (he circled Catfish first without receiving any signal) or where he actually landed (Boreas 2) is not clear from the report. Lockhart touched down at 01.45 hrs to deliver one (unidentified) passenger and three packages but on taxiing, crashed into a grass covered ditch and destroyed the aircraft's undercarriage. This incident was later described by the OC of 161 as an inexcusable error on the part of the ground party. "I then destroyed the IFF and disembarked the passenger, who, with reception committee, made their escape after arranging that I would wait one hour before burning the aircraft. At 02.10 heard a Lysander (see below) overhead and gave signal of letters of my name, but received no response. At 02.55 hours, having destroyed auxiliary petrol tank with axe, I set fire to aircraft with incendiary bomb. Aircraft burst into flame at once and went on burning for two hours (I received information the same afternoon that the aircraft was entirely destroyed, type practically unrecognisable). After destroying the aircraft I followed the reception party to pre-arranged rendezvous." The only other Lysander pilot out that night was P/O McIndoe on Operation Catfish who reported a series of dots from torches from the ground which he apparently interpreted as a warning not to land. The established procedure for ground parties was for the landing lights to be extinguished immediately after the aeroplane had touched down, so when McIndoe arrived there would have been no lights showing. The agreed signal from the ground to tell a pilot there was a problem and that he was not to land, was a series of flashes, and in the continued absence of a flare path, to leave the area, so McIndoe's actions seem entirely reasonable. The reception party would have included Lockhart's intended passengers for the return flight Christian Pineau (who Lockhart had collected in March and who had subsequently returned to France in April) and Jean Cavailles. 18 November 1942 (SOE Operations Skid and Skate): S/Ldr Lockhart took off from Tangmere in Lysander V9353 at 20.55 hrs. He had two (unnamed) passengers and six packages on board to deliver to Les Lagnys field 15 miles NNE of Chateauroux. Lockhart flew in formation with P/O Vaughan-Fowler in a second Lysander as far as the Loire where they lost contact and reported dense cloud from 2,000 to 5,000 feet with thick fog around the target area. He circled the target several times but received no signals from the ground and so at 01.10 hrs set course for Cabourg (sic). He flew below the cloud to the French coast before climbing into the cloud and then encountered search-lights and heavy flak near St Malo. After 'extensive evasive action' he climbed out of the cloud near Jersey where he was attacked by seven Fw190s. Two made a head-on attack while another fired by rear starboard quarter. Throttled back and spun down to cloud cover. Was fired on accurately in cloud so dived for sea level. Passenger warned of another fighter astern and after avoiding balloon, climbed into cloud again. Flew in cloud for twenty minutes asking for heading. Received information I was over Selsey Bill (Sussex) three minutes after passing over Alderney (Channel Islands). Continued in cloud until estimated in mid-channel and gave order “prepare to jump”. After further agreement with Zonia, Woodcock, Pelmet, Medoc and passengers decided not to jump. Landed at Warmwell (Dorset) at 04.40 hrs. Took off with 215 gallons, landed with 5 gallons. I believe that Zonia, Woodcock, Pelmet and Medoc were DF homing stations or radio direction aids and (I am told on good authority) were used together with a Dalton computer strapped to the pilot's leg. 17 December 1942 (SOE Operations Chub, Minnow, Menhaven and Starfish): S/Ldr Lockhart took off from Tangmere in Lysander V9283 at 21.20 hrs. He had two passengers (Louis Kerjean and Jean Simon) and eighteen packages to deliver to the Univers landing field at Chavannes, south of Bourges, and two passengers (one of them Cdt Marchal) for the return. "I was airborne at 21.20 and after contacting Zonia set course for Cabourg. With no delays I reached the target at 00.30 in the face of a headwind. The signal was received promptly and I landed over the wood from NNE to SSW touching down precisely at light A. After passing light B there was a severe jolt and I found elevators and rudder were inoperable. I climbed down and found the tail wheel snapped back into the fuselage. After breaking bottom rudder struts to free the rudder, I embarked with two passengers and took off on the tail trimmer as the stick was immovable fore and aft. Luckily became airborne. Flew aircraft by throttling back and stalling aircraft every two-three minutes to allow nose to fall to horizon. Finally landed at base at 04.00 hrs, again by use of tail-trimmer and throttle." 22 December 1942 (SIS Operation Jaguar): S/Ldr Lockhart took off from Tangmere in Lysander V9367 at 20.00 hrs. His destination was a field at Sermoyer, near Macon, where he was due to collect an SIS agent. Visibility was clear until Lockhart reached Blois (on the river Loire) at which point he encountered thick fog and cloud, forcing him abandon the mission and return, landing back at Tangmere at 02.30 hrs.